The following article aims to summarize the tragic end of the Pontic Greek civilization in northern Turkey—a series of events less researched and documented than the Armenian Genocide, but equally denied and covered up by the Turkish state. By Raffi Bedrosyan (Armenian Weekly) - The annihilation of the non-Turk/non-Muslim peoples from Anatolia started on April 24, 1915, with the arrest of 250 Armenian intellectuals in Constantinopole. Within a few months, 1.5 million Armenians had been wiped out from their historic homeland of 4,000 years in what is now eastern Turkey, as well as from the northern, southern, central, and western parts of Turkey. About 250,000 Assyrians were also massacred in southeastern Turkey during the same period. Then, it was the Pontic Greeks’ turn to be eliminated from northern Turkey on the Black Sea coast, sporadically from 1916 onward. 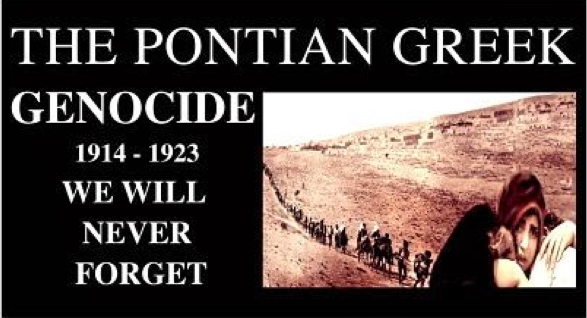 The ethnic cleansing of the Pontic Greeks got interrupted when the Ottomans ended up on the losing side of World War I, but their real destruction resumed in a well-organized manner on May 19, 1919. Pontic Greeks continuously inhabited the southern coast of the Black Sea in northern Anatolia since pre-Byzantine times. The ethnic cleansing of the Pontic Greeks followed the same pattern as the Armenian deportations and massacres: Citing security threats and suspicions of possible cooperation with the Russians, in the spring of 1916 the Ottoman government ordered that all Pontic Greeks be removed from the Black Sea coastal towns to 50 kilometers inland. Of course, in the case of the Armenians, the deportation orders were not only in the eastern war zone, but applied to every region in Turkey. The Pontic Greek deportations were carried out by the Special Organization (Teskilat-i Mahsusa), the same governmental organization that carried out the Armenian massacres, manned by convicted killers released from prisons. Documents show that the longer the prison term, the higher the rank given by the government for these criminals in carrying out their destructive tasks. Naturally, the Greek deportations soon transformed from relocation to robbery to mass murders. . . . .